Contrary to popular belief, filling a room with adults and alcohol does not a good time guarantee; there will always be the wallflower, someone whose night alcohol either ruined or cannot save, someone for whom a party is not quite the fun it promised. A girl looking down following her boyfriend's insensitivity; a boy finding the courage to tell someone he fancies him, only to find his feelings are unrequited; somebody boasting about all the "ones he's got on the side"; your own significant other, who you think you hear laughing behind a closed door — these are the people you'll meet on Andy Shauf's poignant third LP, The Party. 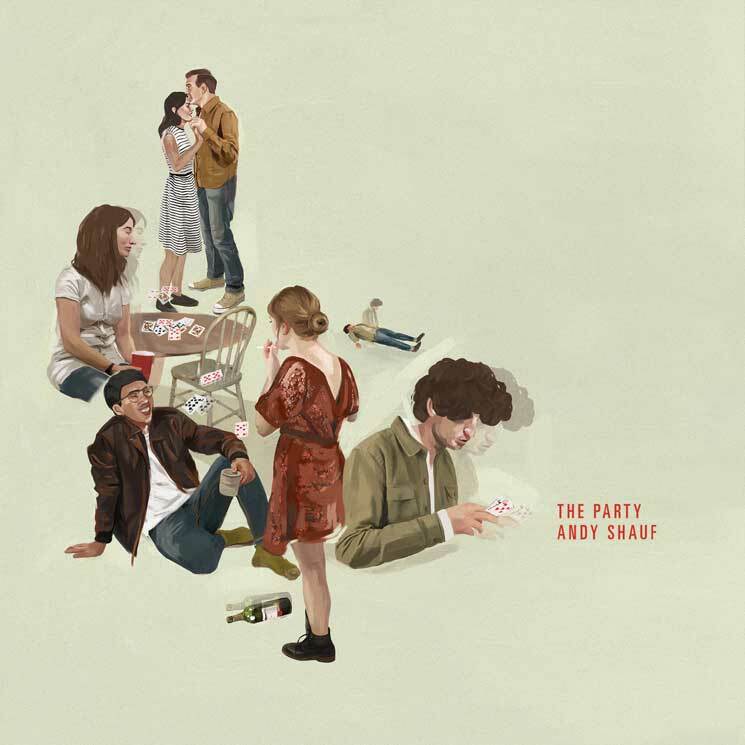 Most of these songs are set at a house party, so though Shauf insists this isn't a concept record, there's at least a sense that they exist in the same world; you'll discover, for example, reoccurring characters, a technique Shauf has mastered since his last full-length release, The Bearer of Bad News. Like Randy Newman and Paul Simon before him, Shauf has a mind for creating character narratives that tell a tale in mere minutes' time. These are characters you'll quickly find yourself caring for, that you'll wonder about once the song's up, that you'll hope will find the happiness they all seem starved for. The emotions of these musical vignettes' stars are palpable in Shauf's stark, poetic and at times heartbreaking lyrics, delivered in his vulnerable, delicate and distinct voice. The bouncy, piano-led "Begin Again" offers a good example of Shauf's ability to pen heartache with a dash of snarky humour: "I don't give a damn about you fooling around behind Sherry's back / it's just the one that you found is the one that I need." Then, later: "Listen to this half-wit, spilling his guts over a bottle of wine / thought this would be a good time, now I can't finish my drink." Clarinets aplenty pepper The Party (Shauf, it seems, is orchestrating the instrument's welcome to the spotlight in popular music: The Party's Bandcamp page is amusingly tagged with "pop clarinet dark Canada"), just one of the many instruments Shauf plays here; in fact, everything you hear, with the exception of Colin Nealis's violin, viola and cello, is played by the songwriter himself, making the already nuanced arrangements here even more impressive. Opening track "The Musician" is lush, weaving delightful vocal "do do dos" with fuzzy guitar, warm strings, pitter-patter drums and tinkling pianos to start the album (not to mention a gorgeous, Yellow Submarine-esque music video). From there, The Party is full of tunes that juxtapose bright and rather cheerful melodies with slightly dark, cynical lyrics, as on "Early To The Party" ("You're the first one there, overdressed and underprepared / Can't he ever show up on time?") and "The Worst in You" ("I saw two closed doors, so I let my heart break / Are you running around, or just running away?). These are taut, conflicting tunes that bid the listener to feel the same discomfort the characters feel, whether it's feeling misplaced and awkward by arriving too soon for the party, or thinking your lover is cheating on you. "Alexander All Alone" is the darkest cut on The Party, as the titular protagonist falls down dead after what was promised to be his last cigarette while an eerie, Timber Timbre-esque melody carries the song, but album closer "Martha Sways" is perhaps the most emotional. Over the same instrumental sparseness that characterized The Bearer of Bad News' "My Dear Helen," our narrator dances with a lady that reminds him of someone he once knew, and soft and patient acoustic strumming slowly build to a swirl of strings as he sings, "There's a weight holding me down / Martha says it's all in my head / I look at the lights dancing in her eyes / and I want to die dancing in her eyes."